This recipe is a really simple, yet incredibly flavorful way to cook swordfish. You may think that grilling fish is somewhat tricky, and that’s true, but swordfish, with its firm, steak-like texture stands up well to this method of cooking and you don’t need to be an expert to have it turn out perfectly. 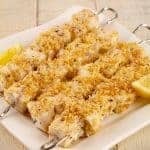 Swordfish steaks cook through in less than ten minutes and all that’s needed to prepare them for the grill is a little lemon juice, olive oil, salt and pepper. 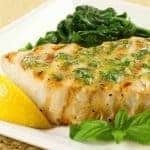 Our simple compound butter, flavored with lemon zest and basil, melts over the fish just as it comes off the grill, adding a fresh, lemony quality that complements the flavor of the swordfish perfectly. Did you know? The average swordfish weighs between 50 and 100 pounds and its sword makes up about a third of its overall length. Most swordfish harvested from US and Canadian waters is sustainably fished and considered to be a good, eco-friendly choice by SeafoodWatch.org. Swordfish steaks range in color from creamy white to pale pink and often have areas of dark flesh (called the bloodline) running through them. Look for steaks where those dark areas are more red than brown as this is a good indicator of freshness. 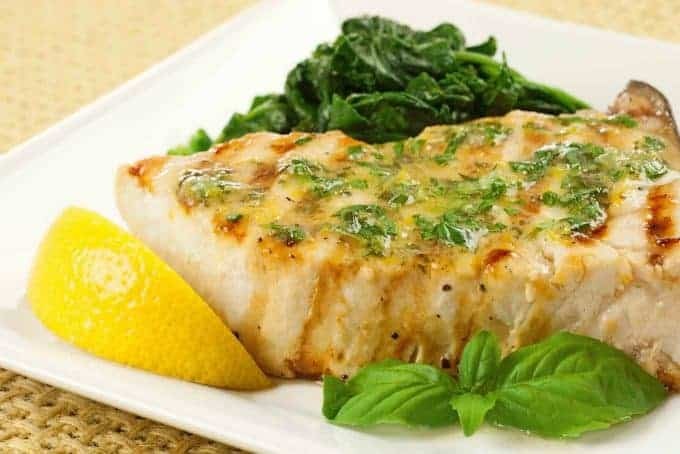 Swordfish is a great choice for grilling, and topped with a herb butter flavored with fresh basil and lemon zest, it makes an outstanding meal, with very little fuss. 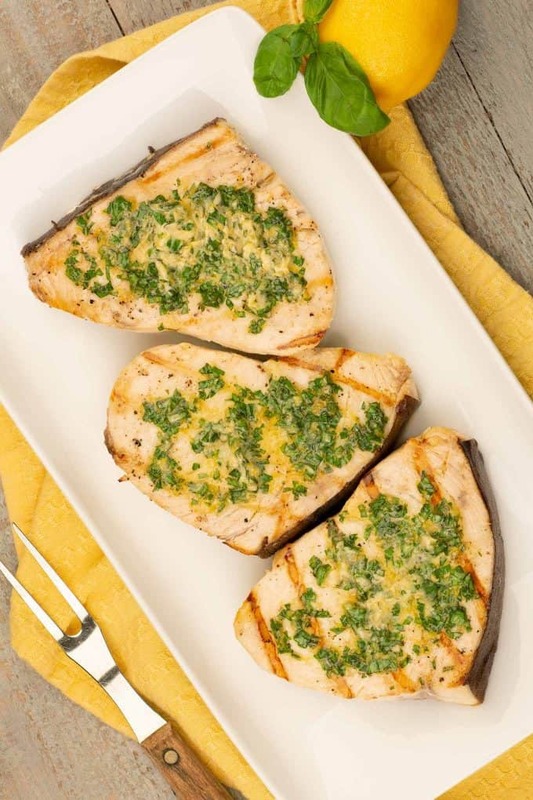 Cut each swordfish steak in half, drizzle with lemon juice and let stand for 1 minute. Rub both sides of each steak with olive oil, salt and pepper and set aside. 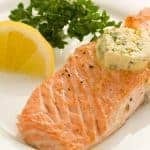 Top each piece of fish with about 1 tablespoon of the lemon-basil butter just as it comes off the grill. Allow to rest for 2 to 3 minutes before serving. This was truely very simple to make and the taste was phenomenal! Thank you ! You’re welcome Roxanne. I’m so glad you to hear you liked it! This was delicious; my entire family loved it. I made it will skewers of grilled veggies (tomatoes and red onion, because that is what I had), cous cous, and an arugula salad. Super fast and easy. I’ll definitely keep this on my rotation for weeknights. Thank you! Glad you had success with the swordfish. The sides you served are a great choice – particularly the grilled veggies. Thanks for sharing! Hi! 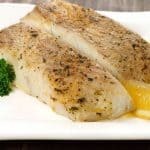 I live in an apartment without access to a grill.. is there any way to prepare the fish using maybe a cast-iron skillet? (I have an overabundance of patio grown basil and I definitely wanted to use this recipe!) Thank you for any assistance! Heat your pan on medium-high and coat the bottom with a bit of olive oil in addition to oiling the fish as directed in the recipe to avoid sticking. Cook for 3-1/2 minutes on the first side, turn, and after 1-1/2 minutes, top with the lemon-basil butter, cover the pan and cook for another 1-1/2 to 2 minutes or until the fish is done. Made this tonight for my family with quinoa/brown rice and a nice salad. Spot on delicious! I just made this for dinner and it was wonderful! First time cooking swordfish and this recipe was perfect. I followed it exactly. Thank you so much for posting! We’ll be making this in about an hr.from now and I’m hoping someone will respond quickly. I’m not sure what you mean by cutting the steak in half. Like filleting it to make it thinner. Oh please someone, advise! No, you don’t want to make the steaks thinner – it’s just that sometimes a swordfish steak can weigh about 1 lb. Cut crosswise into 1/2 lb portions. Or cut after cooking, it’s totally up to you. Hope this helps. Love this recipe . . .
I’m happy to hear you liked the recipe. Thanks for taking the time to leave a comment! 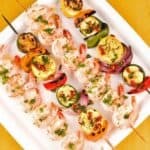 Love this recipe – the lemon basil butter adds so much bright flavor – serve to guests ~they will be very impressed! Thanks for taking the time to get in touch. The lemon and basil really do brighten up the flavor of the swordfish – of course the butter can’t hurt either. Had this tonight, it was fabulous! (And I forgot thr basil! ).